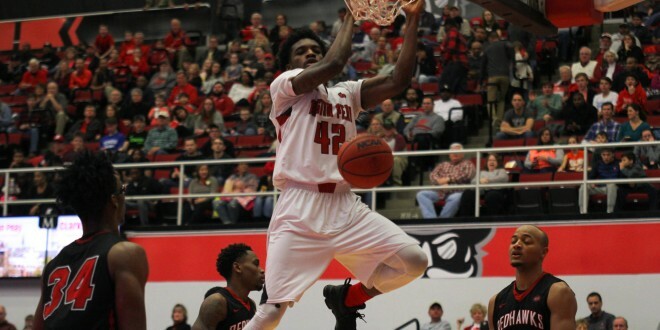 APSU basketball continues their impressive season under first year Head Coach Matt Figger, defeating the Southeastern Missouri Redhawks on Saturday, Feb. 3, by a score of 96-81 and improving their record to 14-10 (9-3 Ohio Valley Conference). The Govs were lead by Averyl Ugba, who has been on fire as of late, going 68 percent from the field, scoring 28 points. Ugba also accounted for 8 rebounds on the night. “I’ve been hard on Averyl because I want what’s best for him and I want to maximize who he is as a person and a player,” Figger said to letsgopeay.com. Along with Ugba, freshman Terry Taylor contributed with 19 points and 12 rebounds on the night. Junior Zach Glotta and freshman Dayton Gumm scored 19 points and 14 respectively. Both teams got off to a blazing hot start in the first half. The Govs headed into the locker room at the half with a 51-49 lead. The Govs were able to shoot 52 percent during the first half, shooting a solid 20-38 from the floor. The Redhawks shot 18 of 27 from the floor. The Govs were able to string together multiple runs of six points but were never able to pull away from the Redhawks in the first half. The Govs opened up the second half with a three-pointer by Dayton Gumm. From there, the Govs opened things up, eventually moving out to a 79-64 lead, going on a 10-0 run. Neither team had much trouble scoring the ball throughout the entire game, as APSU and Southeastern Missouri both shot 55 percent from the field. The Govs had the edge from beyond the arc, shooting 58 percent from the arc, while the Redhawks shot 38 percent. The Govs shot nearly 79 percent from the charity stripe as well. The Governors were able to out-rebound the Redhawks 34 to 27. “They’re really good at sharing the ball, passing and stretching teams out. I had to really shrink the floor in the second half,” Figger said to letsgopeay.com. The Govs limited themselves to just 10 turnovers, while Southeast Missouri had 14. The Govs looked impressive in the 15 point win, improving their conference total to 9-3. The Govs will look to continue their hot streak and find a tenth win in the conference when they travel to Murray State to do battle with the Mu**ay State Racers on Feb. 8, in the Battle of the Border. Mu**ay sits at 10-2 in the OVC.